Sorry to get this out so late. I figure that some people may still do part of their Christmas celebrating this weekend, so I'll slide this holiday album out to you. This features the same cast as "Keeping Fit with Annie", but also includes the character of Miss Hannigan. (She was never in the comic strip, was she?) A couple of crooks plan on stealing money from the orphanage, but Annie, Sandy, and the gang all come to the rescue. I've actually got a couple more Christmas albums coming my way. Depending on how late I get them, I'll either get them up here as soon as I can put them together or I'll wait until next year to get them up here. I hope everybody had (or will continue to have) a wonderful Christmas! Merry Christmas from Me and Bob Hope! Anyway, as pleasant as this album was, it was all about the pictures for me. First of all, somebody wrote "Discard" in big letters using black marker on the front cover and there was a big sticker in the top right corner that I couldn't get off. This was my first experience using Microsoft Paint to get rid of the incriminating evidence. I think I did OK for a rookie, don't you? See this young guy in the ruffledy shirt? I saw that and joked to myself, "Hey, it looks like they got 'Dukes of Hazzard' star John Schneider to perform on their album!" Yep, that's really him! I think he performed the voice of David's father and later sang the Auctioneer's Song. (In fact, I seem to think for some reason I might have heard him sing that song somewhere else. At a telethon perhaps?) This album was copyrighted 1977 and "Dukes of Hazzard" started on TV in January 1979, so this may have been one of the last performances Schneider did before he started working on the show. This is kind of an odd one. It was the soundtrack to a television Christmas special shown on ABC on Nov. 28, 1965. It takes the classic Little Red Riding Hood story and puts a Yuletide slant on it. And check out this cast list: British actor Cyril Ritchard (at that time known as the definitive Captain Hook from the musical "Peter Pan") as Lone T. Wolf; Liza Minnelli as Red Riding Hood; Sinatra-esque singer Vic Damone as the Woodsman; and the Animals (yes, as in "Eric Burdon and the") as the Wolf Pack. If you like Liza and Cyril, they have most of the songs here and, as would be expected, do a nice job on them. Unfortunately the Animals only have one song here, but it's a fun one nevertheless. 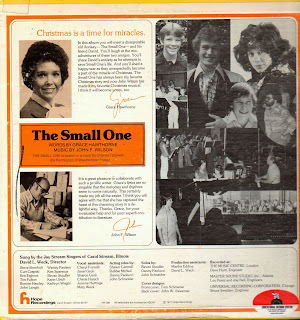 I don't know how much the special focused on the Christmas connection, but only three of the songs here reference it. So while I'd call this one only tangentially related to Christmas, I'm counting it anyway! Hey, I just found out that this special was recently released to DVD, and you can get a copy of it here! Hi! Here's a Christmas album for you. Hopefully nobody has put this one up yet. Except for the title track, all the rest of the songs here are original. This one's a mixture of some silly songs and some rather serious ones as well. Anyway, here it is and I hope you like it!